What is all this about trust? Well let me tell you — it is very needed. In this technology age, with ratings and reviews, etc — they are so easy to get, but are they trustworthy? If you are looking at getting something new, you can tweet out pictures to people asking their opinion on something. So — what is their opinion? You could look up ratings on Amazon, Google, Itunes, and many other places. You need to build trust before people purchase from you. They need to know you, like you and trust you, in that order. So how do you go about building trust — especially online? There are all sorts of ways. 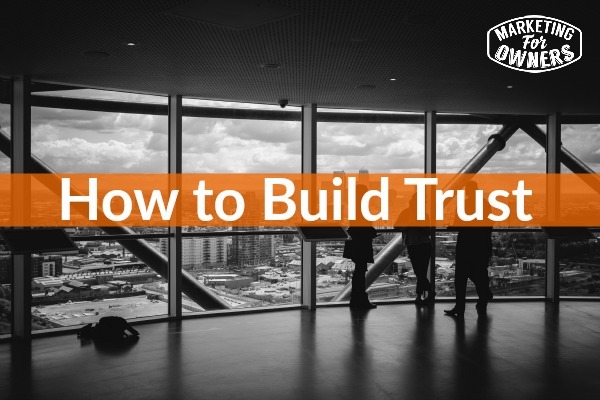 Today I am going to share with you 6 tips to start building your trust. If you can get these nailed, you will be on your way. These are simple common sense ways. If I had someone writing this podcast and me reading it from a script, you would know. Seriously — I cannot make this stuff up! I have to be me on this podcast. When I do these, there is no script — maybe just a couple of notes for myself. These are ad libbed and the things that I share come from my experiences and things I have learned. That’s the way people want it. People will want to know you. If you are writing, recording a video, doing a podcast — whatever — it is you. It is not the company. The things you talk about should come from some of the questions you get asked. For example — this podcast has come from a couple of emails that I received where people was asking how to get them to trust you when they can’t see you. So, try to answer it the best way you can. Listen more than you talk, but answer what they are asking you. Now, that means at all times. You can have a laugh and a joke. You can be silly. You do not wish to be photographed on your Twitter or Facebook page stumbling out of the office Christmas party drunk. You do not want to be seen voicing your religious or political views on your company page. Just be professional. You can have your personal social media profiles that are set apart from your business ones, but even then — you need to be professional on those as well. The Internet does not forget my friend! It will not go away. 15 years from now, it will still be around. People like strong management and strong leadership. This does not just apply to work. By being strong, that does not mean being a tyrant. People will work better for you when you lead them correctly. In order to be a leader, you have to have people to lead. Now as an effective manager, you need people to understand why you are managing them. They need to understand why you are the leader. If you can empathize with them and get this across, you will be moving forward. You can involve people instead of being a tyrant. This makes a different. If you are too friendly, your staff will not appreciate when a little discipline needs to be involoved. Give your audience what they want and need. Ask them and then give it. Be a servant to people. If you want to get trust, you must admit when you make a mistake. If you really want to get trust though, then don’t wait — especially like politicians when they wait until they are found out. Why not come out with your mistake before it becomes public? You will find people will like you and see your honesty shining through. Once they feel that you are honest, they can trust you. It all makes sense. You can teach your managers at work this concept. It works at all levels. It is a Monday and it is Christmas week. We need to have a book for the week. It is all about marketing this week. The book I recommend is Water Tight Marketing by Bryony Thomas. 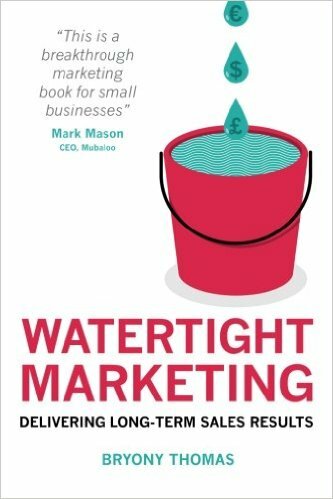 It is great because it is described as “the book on marketing that makes all the others makes sense:. She says that we are like leaky buckets and all of our profits are leaking out. She teaches us how to plug those leaks and move forward in our business. Go check it out and I will chat with you more tomorrow.